AS A NATION, we may not be known for our pearly white smiles, but the general level of oral health in Ireland has improved in recent decades. However, with State support for dental care now severely curtailed, the danger is that dental health will begin to deteriorate again. Though you may be loath to pick up the tab for services that were once free, neglecting your teeth is always a false economy. The longer you delay that trip to the dentist's chair, the more likely it is that a niggling little problem will develop into a much bigger, and more expensive, one. So what can be done to lessen the financial pain of dental care? From January 2010, the Government curtailed all support for treatments that used to be covered by the PRSI dental scheme, other than an annual examination. Subsidies for routine treatments such as fillings and extractions are no longer available. However given that a dental check-up can, in some cases, cost more than €80, one free exam a year is not to be sniffed at. So before you visit your dentist, check whether or not you have satisfied the necessary PRSI conditions to qualify for the support by calling the treatment benefit section of the Department of Social and Family Affairs at 1890-400400. Next, check whether you are entitled to tax relief on any dental procedures you require. While relief is not available for routine treatments such as scaling and fillings, it can be claimed on more expensive work such as crowns, root canal treatments and bridgework. Straightforward extractions are not covered, but the cost of the surgical extraction of impacted wisdom teeth is allowable. Before 2009, relief was available on qualifying dental expenses at the higher rate of tax, but for 2009 onwards, relief can only be claimed at the standard rate of tax, which is currently 20 per cent. If you can make yourself understood with a numbed-up mouth, ask your dentist to complete a Form Med 2, and submit this to your local tax office. The Revenue allows a four-year window to apply for relief, so it's still possible to claim relief for any qualifying procedures carried out since 2007. Thirdly, if you have private health insurance, check whether dental treatments are covered by your policy, or whether discounts are available. For instance, Aviva offers its members discounts on certain procedures with the Smiles chain of dental clinics. Also, Vhi has developed a new standalone product called the Dental Starter Plan (which is cheaper but more restrictive than its existing Dental Plan product), but you should think carefully about whether the cost of this cover is likely to be justified. For someone aged between 18 and 39, the Dental Starter Plan will set them back €125.17 a year. This will cover them for half the cost of basic procedures such as fillings, extractions and treatment of gum disease, up to certain limits. There are a number of conditions that may give potential customers pause for thought. For instance, an excess of €100 applies, and the plan will only cover 40 per cent of the cost of root canal treatments (net of tax relief) up to a maximum of €245 per tooth. However, a root canal procedure with a Dublin endontics specialist will set you back almost €800, or €640 after tax relief. Also, the policy does not cover the cost of crowns, which are generally required after root-canal treatment, and which can cost in excess of €700. Furthermore, a waiting period of up to 12 months may apply under the Dental Starter Plan for major treatment such as root canal. Another option is to shop around, as prices can vary dramatically from one dental practice to another. For instance, research conducted by the National Consumer Agency last year found that the national average price for a simple extraction was €82, but within this, charges ranged from €40 to €150. Despite the disparity in prices, a survey conducted by the Irish Dental Association found that most people select their dentist on the basis of the convenience of their location. Only 2 per cent said that value for money was the main factor. The difficulty with shopping around for dental care is that the customer very often has to pay for an initial examination in order to find out what further treatment is required. However, some dentists are becoming more transparent when it comes to pricing, and are also cutting their fees. For instance, Phoenix Dental in Ashtown in Dublin 15 is running a deal during February and March, offering porcelain crowns for €480 instead of €700, a scale and polish for €40 and free check-ups. For those willing to travel a little further, there are significant savings still to be had in Northern Ireland. It's worth remembering that if you cross the Border for non-routine dental treatment, you may still be able to claim tax relief as long as the dentist is a qualified practitioner. One savvy consumer tells us he was quoted a price of €1,800 for root-canal treatment on two teeth with a Dublin dentist, and decided to opt for a dental surgeon in Newry instead. In the end, he only required treatment on one tooth, which involved two visits costing a total of £350 (about €411) – plus about €40 in petrol – which he describes as an "absolute deal". "But to be honest, it was more than the cost," he says, explaining that seven years ago he had a traumatic root canal experience with a Dublin dentist, although he says that "in fairness the technology has probably changed" in the meantime. He says his decision to head up North may be unpatriotic, "but tough times call for tough measures". For those who don't wish to drive several hours every time a toothache strikes, the promise of Northern Ireland prices south of the Border is currently being offered by Smiles, which has 13 clinics throughout the country. Last year, the Smiles chain took the drastic step of dropping its prices by 30 per cent to match prices on offer in the North – and it has paid off. Within a short space of time they saw a 50 per cent increase in customer numbers. Founder Emmet O'Neill explains that because Smiles is bigger than most dental practices, they can buy in bulk and spread their overheads across a greater number of dentists. Of course, your choice of dentist shouldn't be based on price alone. For starters, just because a dentist's prices are high, it doesn't necessarily mean you are getting ripped off. You might well be receiving very high quality, specialised dental work. Also, other factors may be just as important as price. For instance, getting recommendations from friends and family can save you money by short-circuiting the search for a trustworthy, skilled dentist, whether they're based north or south of the Border. I'M AT AN age when it is time I did something about my teeth. Either that or lose them. I've recognised this for a long time but, not unusually, did nothing about it. Then one of my beloved sisters – in whom I am well pleased – heard about this clinic in Dublin's Ranelagh called Access Smile which was operated by dentists from Hungary and who organised treatments for Irish patients in the country's capital Budapest for a fraction of the price in Ireland. Said sister arranged an appointment, then told me about it. "Access Smile? ", I said. "Forget it." I thought it was some sort of cosmetic job, but it isn't. So I went along. They were very friendly, very professional and told me what needed to be done. It was up to me to decide what/or if I wanted to take it further. Knowing myself, I decided it was either then or never, and so we agreed what should be done and when. They arranged appointments in Budapest and accommodation. I arranged my own flight at short notice and, hey presto, I was there. I could hardly be happier that I went. I had six fillings, four crowns, an inlay and a bridge where I broke a tooth a few years ago. They also cleaned and polished my teeth, all in a state-of-the art clinic in suburban Budapest, where they take you by car for treatment and back again to your accommodation each time. (They also meet you at the airport and take you there again for departure after all is done). As with most people, I hate going near a dentist, but it could not have been made easier. I felt no pain at all. And it is not all done all at once. You have days off in between. I was there for seven days in all, just three at the clinic. And what a stunning city Budapest is, with lovely helpful people, most of whom speak English, but with an appalling history! Thats the tourism bit. The million dollar question – price? OK. Six fillings, four crowns, an inlay, a bridge, teeth cleaned, seven nights in a beautiful city- centre apartment with breakfast (if I wanted it, but mostly I'm not a breakfast person), and return flights to Budapest – what do you think? It cost exactly €4,172. Teeth sorted for the rest of my days, a holiday in a remarkable city – and a dental clinic in Dublin for recommended six-monthly check-ups. Am I complaining? Am I what? Just last week, I was talking to a friend who had work done in Dublin on three teeth. It has cost her €15,000. Are we mad? I can fly out to Budapest, stay for a week, have three times as much dental work done and it still comes in at less than a third of what it cost her in Ireland to have work done on three teeth. If any of this is of use to you, contact access-smile.ie or ring them at 1850-493493 for further information. Clearly, I recommend them for dental care. Why did Kathy Durkin choose Access Smile for her dental treatment in Hungary? Many of us love and listen to Kathy Durkin's unmistakably Irish voice as one of Ireland's favourite entertainers. She is well travelled, often tours the US, UK and Ireland to perform but Hungary as a choice for dental treatment sounds unusual. We asked her why she chose Access Smile, one of the best-known clinics in Budapest. KD: As a stage artist, I think it is vital that my teeth are in good condition and my smile is one of my signatures – apart from my voice, of course. 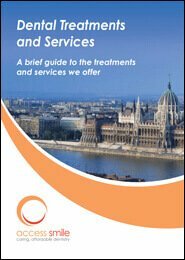 But treatment in Ireland is often expensive and I heard from a friend that many Irish people go abroad for treatment – and Access Smile in Hungary is a good choice. Metro: Did you not have concerns? KD: It is a big step to have major work done abroad but Hungary is famous for dental tourism, Access Smile had very good references – even Patsy McGerry praised them in the Irish Times – and the great back-up surgery in Rathgar, Dublin convinced me that I would be in safe hands and any problems would be attended to. Metro: What was the procedure? KD: I contacted them though their website – www.access-smile.ie and they rang me back very quickly. I decided to go for a pre-assessment in Dublin first. The Rathgar surgery was very modern and their dentist is lovely. She made a very thorough assessment and gave me a couple of treatment options. I picked one and made the booking for treatment in Budapest. Metro: And what was your impression in Budapest? KD: Access Smile was very professional, it all went like clockwork. They contacted me with Hotel options and made the booking for me. Martin, their driver picked me up at the airport – what a lovely young fellow – and very knowledgeable, too! He gave me a guided tour of the main sights and I have to say that Budapest is a remarkably beautiful city. Metro: And what about the clinic? KD: Wow, nothing like I had seen before! Very modern, screens everywhere and the staff are absolutely adorable! Everybody is smiling, they all speak English and the place looks squeaky clean, I forgot I was at a dental surgery! Their clients are a good mix of local and foreign and I was not the only "famous" person there – there was somebody else from the UK , too! And Gabriella, my dentist was amazing. She explained everything very clearly and the treatment itself felt like nothing. But everything worked perfectly. And because the Clinic is in a shopping centre, I even popped in for a coffee when I did not have any appointments! Metro: So how would you rate your experience overall? KD: Five star! Fantastic dental work, good savings, great organisation and service. I can only recommend Access Smile from the bottom of my heart!" Some people travel for business. Some travel to broaden their minds. Others travel to get their teeth done. The availability of cheaper flights, coupled with the price of dentistry in Ireland and the opening up of markets which, in the past had been closed, has made the whole area of dental tourism grow in a very short time. And the main beneficiaries of this whole new area of travel have been the Irish people who may have always required extensive dental work, but who in the past might have found the whole escapade that bit too expensive. Of course, the idea of leaving these particular state boundaries for the sake of dentistry is nothing new . . . people have been travelling to Northern Ireland to avail themselves of cheaper work for years. But the new fashion is to travel that bit further . . . mainly into Eastern Europe . . . a practice that is yielding quality work at a fraction of the price at which it is available in Ireland. Not that the idea of going to Eastern Europe for dental work is new either. For years, progressive peoples such as the Germans and Austrians have known of the significant advantages of travelling across borders into former communist block countries for their dentistry. But they always had the advantage of being on the doorway of these countries, while we Irish have been somewhat isolated on the western tip of Europe. Nevertheless, cheaper flights and a greater willingness to travel have broken down many barriers in the past, and the Eastern European frontier has proven to be of little hindrance for people looking to get a quality dentist at an affordable price. Still, travelling for dentistry will not suit every problem, and it only really makes sense if people are having extensive work done. But a quick cost comparison can tell its own story, and obviously the greater disparity between the Irish price and its international counterpart, the more likely it is that people will travel. Premier Access Healthcare ltd, trading as Access Smile, is a company which was established by Helen O'Brien, an Irishwoman who recognised the advantages of travelling for dental work. Access Smile does not market itself as the cheapest dentistry on the market . . .
rather, it sees itself as a gateway to a quality service at a much cheaper price than is available in Ireland. So following an initial consultation in Ireland, Access' clients will travel to Hungary for their treatment, which will be significantly cheaper than it would be at home. For example, according to research carried out by Access, two implants, six crowns and two root canals in Ireland will cost 12,840. At a state-of-the-art clinic outside of Budapest, the same treatment will cost 5,120, leading to savings of 7,720. So even given the cost of flights and accommodation (and people may have to travel more than once for the treatment), huge savings can be made by travelling to Hungary, particularly if the dental work is fairly extensive. "The reason why Hungary is so much cheaper than Ireland is not that they are using inferior materials," said O'Brien, "it is that the cost of living is so much lower in Hungary, so the dentist is not paid as much for the work. In fact, in many cases, the materials used in Budapest are actually higher than they are in Ireland, and Hungary has a very strong reputation for its healthcare, and specifically for its dentistry." Access will organise everything that a person needs for their trip to Budapest, except for the flights. It will even give its clients a free public travel pass for the duration of their visit, and a mobile phone with pre-keyed in numbers to facilitate people in their day-to-day Hungarian business. And for people who might be wary about the service that they will receive, Access has undertaken to refund any remedial work as a result of the Hungarian treatment, even remedial work carried out by an Irish dentist. VitalEurope is another company which provides a link between Irish people and Eastern European dentists. Based in Budapest, it allows people to choose from a number of clinics in Budapest and Prague, and is even looking to offer a Spanish arm to its service. But people will not have to travel to Eastern Europe without knowing that it will be worth their while. VitalEurope is the first dental services provider of its kind to offer consultations in the UK, and contracted dentists will receive VitalEurope patients at a London clinic, in the vicinity of Victoria Station and Buckingham Palace, twice a week for consultations from April 13. It is also looking at opening a Dublin office for its initial consultations. "Most people travelling overseas will have a lot of work to be done on their teeth" said VitalEurope founder and CEO Thomas Antalffy. "This is rarely done in one sitting. So we meet our clients in London, and set up a treatment plan just for them, outlining the amount of leave from work which they will need to take, and working out a financial plan for payment." Because it utilises the service of a number of clinics throughout Hungary and the Czech Republic, VitalEurope is constantly monitoring the quality of the dentistry throughout its Eastern European partners' clinics. This allows it to ensure that its clients are getting the best treatment possible at the best prices available. Still, there is more to dental tourism than sitting in a dentist's chair, and travelling to Budapest or Prague, it allows people to see two of Europe's finest capitals whilst having their teeth done. Prices in both of these cities are phenomenally low, and people can save simply by staying in a quality hotel and soaking up the atmosphere of these cultural cities. Which is enough to make any smile shine that bit more brightly. Cork-based Access Smile was founded four years ago by managing director Helen O'Brien, after she discovered that Hungary has a level of sophistication in dentistry that is superior to Ireland. Access owns its own clinic in Budapest and uses a surgery in Dublin to provide any aftercare services such as stitch- removal or any necessary minor adjustments or problems. The clinic consists of three dental surgeries and an X-ray room off a large reception area. The chief dental surgeon is Dr Gabriella Nyiri, who explained that Access offers the full range of dental services, from the most basic cleaning and bleaching to orthodontics, and a popular cosmetic service known as Smile Design. This uses a computer-assisted design technique to assess unevenly placed or oddly shaped teeth before coming up with a solution to improve the clients smile. Another of the advanced techniques the clinic uses is an air abrasion system with spray. This 'drilling-without-a-drill' treatment uses a jet of fine powder that takes away the decayed part of the tooth without causing any damage to the rest. It also means no anaesthetic is required. Depending on the work to be done, the cost saving can be significant. Says O'Brien: "In Ireland, you can be quoted anything between €700 and €1,500 per crown. In Hungary you're talking about €400. Ceramic would be the highest-quality material. In Hungary the price is about €500 to €600. The same product in Ireland would set you back about €2,000" Implants typically cost €1,000 in Hungary compared with €4,000 in Ireland." O'Brien's view is that costs are so much higher in Ireland because the profession is a closed shop. "In Ireland, 4,000 dentists serve a population of four million, while Hungary has over 48,000 registered dentists for 10 million people." Details:www.access-smile.ie. "...they book your accommodation, pick you up at the airport, and give you a mobile for 24-hour contact should you be experiencing any pain after having any work..."
Living the high life has cost Fearghus de Mórdha his teeth, but getting them fixed is going to cost him his car. BEAUTIFUL SMILES are something that have always been in fashion. There's no denying that a healthy set of choppers is a key component and a real status symbol, too. The only time you look cute with a gummy smile is when you're a baby. Realistically though, a display of teeth in the animal kingdom is a statement of how quickly you can tear your opponent to shreds. Not to be underestimated, either. I met a friend for coffee the other day and he was looking forward to going out that night and having a steak for dinner for the first time in a year and a half, with his new set of teeth. They did, indeed, look good together. It had taken 18 months of trips to Budapest to achieve a Hollywood smile. However, it was almost a little too much for a man of his years. People in their late 50's aren't really meant to have gleaming Hollywood choppers, are they? I have never really been able to see myself with a set, but perhaps this is changing. I never got my full set of adult teeth, so I knew I would lose some, but being quite a bit more of a party animal than most people through my 20's has also taken a serious toll on my teeth. I showed a friend the other day the result of the damage and she gasped. A dental specialist has indicated that I would need bone grafts along my lower front jaw, if I want to have any type of teeth in future years. The bone and gum would have to be cut from the upper palate and grafted on. I'm in my early 30's, so I would prefer to try to keep what I have left of the real ones, but permanent implants would not be an option either without the bone graft. The teeth need something to hold them in place. The full estimate was €15,000 for a Hollywood smile and €10,000 for a good patch job in Budapest over two trips. A lot of cash, so I had to contemplate whether I was prepared literally to put my money where my mouth is. It didn't take much thought to come to the conclusion that I'd prefer a nice smile to my car, so that was the decision made. The same dental work would actually cost three times as much in Dublin, so Budapest here I come. What I was surprised about, though, was the professionalism of this foreign dental service, Access Smile. My own dentist was remarkably unhelpful and suggested that I have an assessment in six weeks' time and think about getting a set of false teeth. I had asked this dentist's predecessor a couple of months before he retired what he thought. He told me that given that I wasn't likely to become a Hollywood actor at this stage in my life, why bother trying to keep them? I assumed he didn't want the business. bizarre. In contrast, the dentist at Access Smile talked me through every step of the process and the success rates and affordable options over detailed X-rays. They book your accommodation, pick you up at the airport, and give you a mobile for 24-hour contact should you be experiencing any pain after having any work. Apparently, the most common use of the emergency phone is for people who have got a bit hammered in Budapest and have forgotten how to get back to their hotel. When I arrived in the airport, there was someone there to collect me. When I saw my name 'Ann Conway' written in English, it was very reassuring. Let's face it - we all want a lovely smile. Straight white teeth not only make biting and chewing easier, they improve our confidence. With dentistry costing a pretty penny here in Ireland, you might want to consider looking a little further afield. Hungarian dentistry has a very good reputation in Europe, with treatments typically costing one third to half of Irish prices. Some call Hungary the dentistry capital of Europe; Germans, Swiss and Austrians have been going there for decades. But what should Irish patients look out for when researching a doctor or clinic abroad? "I would suggest going for bigger companies with a long-term reputation, as it is these companies that can continually invest in the latest technology," says Dr Ildiko Cservenyak, Marketing Director of Access Smile, an Irish Company with a dental clinic in Budapest. "An Irish base is a great advantage as it gives clients extra security when it comes to aftercare issues. "It is also worth asking if you can talk to previous clients. Guarantee provisions are also very important and they also need to be careful of 'virtual clinics' who have a webpage and then, when problems arise, just change the web appearance. Also be careful when the price is suspiciously low." Hungary is an EU country, meaning that its standards are in line with the EU. Dentistry is a closely regulated business and in some cases, rules are even more stringent than in Ireland. For example, in Hungary, IV (intravenous) sedation can only be administered by a qualified anaesthetist. Cservenyak stresses the importance of pre-consultation before going abroad for dental work. "It allows the client to meet a dentist from the clinic, ask any questions and receive a treatment plan in advance of travelling for treatment," she says. "Aftercare is also very important as are guarantee provisions. It is with these that the patient can feel fully comfortable with the decision to have extensive work done overseas." Nichola Nolan is the Irish Account Manager of Access Smile's Irish base. Once an Access patient herself, she overcame her fear of dentists after receiving treatment in Hungary. Irish and based in Dublin, she has firsthand experience of being a patient and understands the fears that Irish people have when it comes to dentistry abroad. "People often think that because the price difference is so significant, there has to be a catch somewhere," says Nolan. "The reason is not because the materials are not up to standard but because the cost of running the clinic, i.e. staff, rent etc is not as expensive as it is in Ireland. All materials and equipment used are of the highest standard." The language barrier is also a big concern for people, who worry that they might not understand what the dentist is saying or what is happening around them. Nolan explains how the process works at Access Smile. "The first call the client receives from the company is from me, so that helps. Then they meet with the dentist who can speak to them in English. We provide an English-speaking customer rep who will meet them on their arrival and help in any way she can. Clients are also given a mobile phone with her number keyed into it so that they always have someone at the end of the phone. All staff at the clinic can speak good English, so communication is never an issue," she says. While for some people, dentistry abroad is simply about saving money, for many it can be an emotional experience that changes their lives. "One client sent us a thank you postcard written in Hungarian with the use of a dictionary," says Cservenyak. "We also received a text message from a patient saying she had just bitten into an apple for the first time in years." Now that's definitely worth smiling about. I'm the worst patient in the world; I've no threshold for pain and I was petrified of the dentist - even of booking a consultation. But when I went for my initial consultation in Dublin, they spent a full hour-and-a half explaining all the details of the work I was getting done and the price. Because I was so nervous, they even gave me a number of another patient who had been over to Hungary, and she reassured me. When I arrived in the airport, there was someone there to collect me. When I saw my name 'Ann Conway' written in English, it was very reassuring. The clinic was gorgeous and the equipment is excellent. Everything is clinically clean, even the waiting area. The aftercare is fantastic too. A month after I had work done, I got a toothache in one of the teeth and I didn't know what was going to happen. I phoned them with the issue. Dr. Nyiri, my dentist rang me back that evening with my x-ray in front of her and explained what the problem could be and what I should do; she didn't dismiss me. I was also assured that if this did not work, they would either carry out further treatment in Dublin or fly me back for remedial treatment straight away. But there was no need as the recommended solution did solve the problem. I met so many Irish people over there too. In fact, some of us are going to meet up after all our treatment is done. I'm thrilled with everything. I've recommended it to my sister and to my cousin. BBC Report - Is NHS dentistry in slow decay? Julia Vorley has travelled from Alrewas in Staffordshire to Budapest, Hungary, to get essential dental treatment. In doing so, the 40-year-old account executive joins a growing band of people looking towards continental Europe for treatment which, quite simply, is not available on the NHS. According to the Office for National Statistics, the number of people seeking treatment abroad has more than doubled since a change in way NHS dentists are paid. Since 2006, NHS dentists are paid for "units of dental activity" - meaning a dentist can end up out of pocket when providing complex treatment. Not surprisingly, a 2008 parliamentary report reveals complex treatment undertaken by NHS dentists has dropped since the scheme's introduction. Ms Vorley's case does not make happy reading. She said: "I had an infection which started up in one tooth. "I went to the dentist and he actually cut the nerve out the tooth, so the tooth effectively died, and that infection then spread from tooth to tooth. "And the dentists just kept taking the nerves out. "So I ended up with my upper jaw all along the front not having any nerves in my teeth at all." Desperate for a solution, Julia looked at getting replacement teeth - otherwise known as implants. But although the treatment is technically available on the NHS, Inside Out could find no dentist who has carried out the procedure under the current system. For private treatment in the UK, Julia was quoted £22,000. She did not know which way to turn, until a friend suggested Budapest as an option. This growth in Britons seeking complex treatment abroad is a trend which concerns the Patients' Association. Spokesman Dr Anthony Halperin, a practising dentist, has a feeling the NHS will be a 'core service' in 10 years' time 'for basic treatment and extractions'. He added: "That will be very sad for the patients of this country." But Chief Dental Officer, Dr Barry Cockcroft, insists dentists are "well paid, very clinically minded, very ethically minded, as a whole". Last year "there were a million crowns and bridges carried out by NHS dentists," he said. Back in Budapest, Julia is about to undergo the final course, which will see her upper teeth replaced for £6,000. Whilst brimming with enthusiasm for the standard of treatment provided in Budapest, she is somewhat less complimentary about the NHS. "I really don't have any faith in it," she said.